« Enter Survey, Win a Laptop Computer! 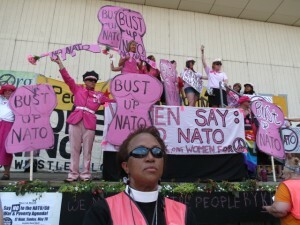 Members of the group Code Pink rally at the anti-NATO protests in Chicago May 20. Photo by Mary C. Piemonte. “We will not pay for your vices, and we will not pay for your wars,” declared Inge Höger from the Left Party in Germany, who said she was fighting to bring her nation’s 5,000 troops back home from Afghanistan and also bring back the thousands of troops who are stationed in other places around the world. Höger added that NATO troops have not been able to bring peace nor provide effective security for the common people around the globe. Mujahid said that seven of the 50 NATO leaders of the summit “are against war, but they don’t listen to their own people,” he said. He said the mission of this generation “is to dismantle the military machine in the United States” and change the culture from war to peace. Willis said the $1.3 trillion the U.S. has spent on the Iraq and Afghanistan wars should have gone to health care, schools and public sector jobs. Demonstrations were also going on at the same time that day in parts of India, Iran, Pakistan and other places around the globe in solidarity with those in America, according to one of the speakers. The Rev. 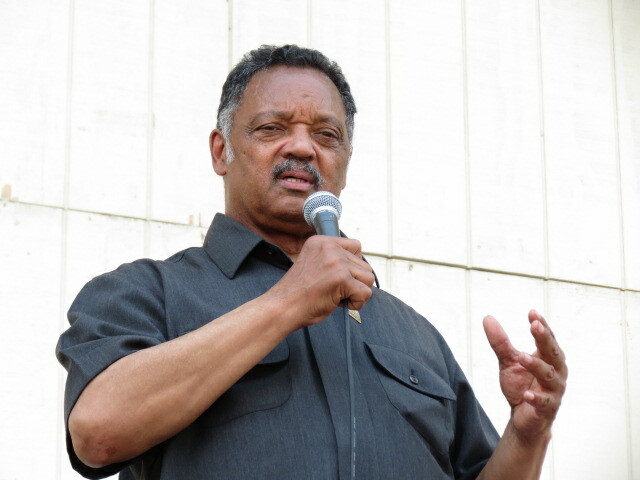 Jesse Jackson speaks to anti-NATO protestors May 20 in Chicago. Photo by Mary C. Piemonte. Before leading the march “against the NATO war and poverty agenda,” civil rights icon the Rev. Jesse Jackson Sr., founder of the Rainbow PUSH Coalition, ended the rally at the Petrillo Bandstand by declaring that less money should be spent on the war and more should be spent on the needs of the people. “We are in more wars and we are less secure,” Jackson said. 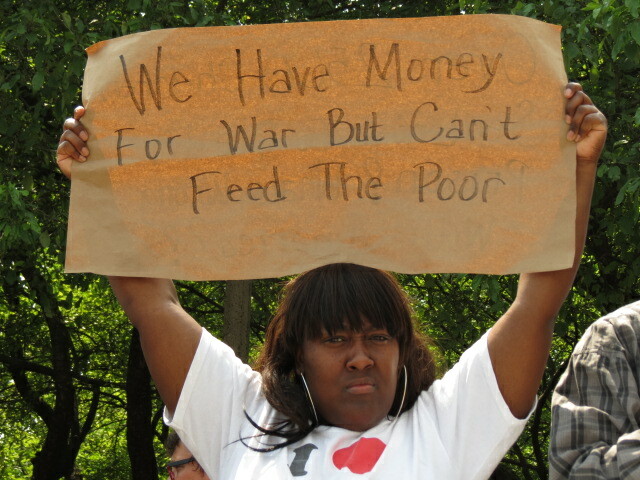 “We spent more money and we are more impoverished and we feel betrayed by this investment of time and money and lives. It’s time for a fundamental change. “We spent trillions of dollars or thereabout in Iraq. What could a trillion dollars do today? “We must stop violence right here at home and go another way. That is too much violence. That’s why as we march today, we must be non-violent, disciplined, and focused. “We must be the antidote to violence,” Jackson said. Some protesters also attended the event as a means to simply get some immediate help for their problems. Chicagoan Jean De Saviey, a street performer, vendor and homeless veteran currently residing at the Save Haven Homes, told Residents’ Journal during the event that he attended the rally to talk to Rev. Jackson about getting him some help with housing. But De Saviey said Jackson said “nothing” helpful to him and added that he was also using the event to sell some items he had. “The best nation in the world is do-nation, and I’m just trying to get some donations because I’m homeless,” De Saviey said. This entry was posted	on Wednesday, May 23rd, 2012 at 10:48 pm. You can follow any responses to this entry through the RSS 2.0 feed. You can leave a response, or trackback from your own site.